Rent Shadowbrook | Corporate Events | Wedding Locations, Event Spaces and Party Venues. Welcome to the Shadowbrook Restaurant. 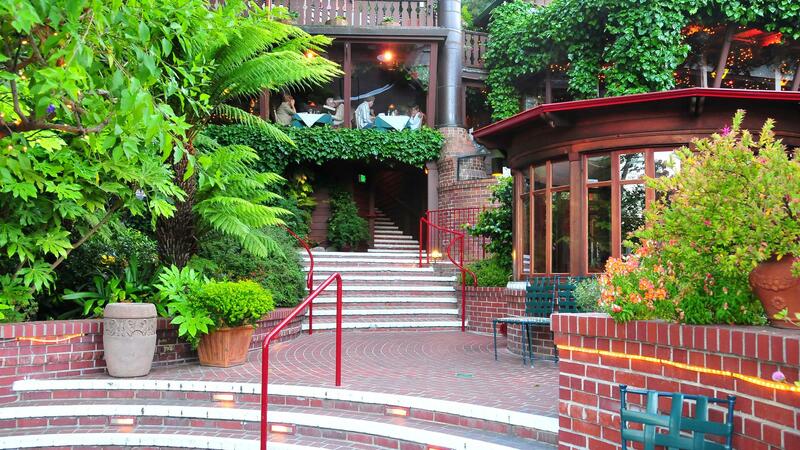 Opened in October of 1947 with a theme of Romance in Dining this is not only the most romantic place to dine in the entire Santa Cruz area but was recently designated one of the Top 100 Most Romantic Restaurants in all of America. Located beside lush Soquel Creek in Capitola-by-the-Sea, Shadowbrook Restaurant is best reached by its own quaint cable car, or a meandering garden path. Since 1947 Shadowbrook has continued to provide world-class service, fine food, wines and liqueurs in an atmosphere of Old-World charm and grace. Thank you for your interest in Shadowbrook's facilities and services for your wedding and reception. For 65 years Shadowbrook has been a favorite setting for exquisite weddings because of its romantic ambiance and magnificent setting on the banks of the Soquel Creek, in the delightful village of Capitola-by-the-Sea. Recognized for being the "Most Romantic Restaurant" in Northern California by the readers of San Francisco Focus, Shadowbrook will make your wedding day even more memorable. More than just a beautiful setting, Shadowbrook's interior has an old world charm that will put you and your guests at ease. Our exceptional cuisine prepared by Executive Chef Roger Gowen, will have your guests amazed talking about their meal for years to come. Shadowbrook´s private business meeting facilities are truly catered to your events. We will provide a screen and AV equipment for you at an additional rental fee and have complimentary use of our wireless internet. Our Owner´s Private Reserve can accommodate up to 15 guests with the use of our pull-down screen and AV equipment. This cozy room features one long meeting table and a fireplace. If your meeting has a few more attendees then we would be happy to move you into our Redwood Room which sits directly next to the Chef´s Herb Garden and features a private patio. With seating for up to 20 guests, you may use our pull-down screen and AV equipment for your presentations. Our largest room available is the Wine Cellar which is right next to the Lower Patio.